Winter in Maggie Valley NC brings cold temperatures and snow, like most mountain towns. BUT, that doesn’t mean you can’t visit and still have a great time! There is always something to do in Maggie Valley NC, even when during the off-season winter months. You’ll find things moving at a slower pace in the winter and far less traffic. Yes, some businesses and attractions will be closed, and some will remain open with off-season hours, while others operate under normal schedules. Also, some of the roads to area hiking trails and waterfalls will be closed. Even the Blue Ridge Parkway, will sometimes be closed, depending on weather conditions. Lower rates – Many hotels and motels that remain open, offer reduced rates. Less traffic and people – Not waiting, no fighting for parking spaces, and no traffic jams. Snow – Many visitors live in areas where they don’t get snow, and seeing snow is a treat. While it doesn’t normally hang around long, you’ll often see snow when visiting Maggie during the winter months. Better views – With the foliage gone, you can see more. Where you didn’t have scenic views before, you often now have a really nice and wide scenic view. Hemphill Schoolhouse on Hemphill Rd. With fewer people in the area, your hike will have more solitude. There is just something magical about a hike in the snow. Word of caution – Due to ice and snow, some trails can be dangerous. Be sure to understand weather and trail conditions before heading out, and bring the appropriate gear to stay warm and dry. During the winter, as temperatures often drop below freezing, something beautiful happens. The water flowing over the hundreds of waterfalls in the area begins to freeze. The ice changes the waterfalls and often turns them into magical and unique places to visit and see. You can find waterfalls in and around Maggie Valley, using our Maggie Valley Waterfalls Guide. Below is a frozen Soco Falls, and really beautiful waterfall just outside of Maggie Valley, near the Blue Ridge Parkway. Trails to waterfalls can be slick and dangerous – We highly recommend using Crampons. Waterfalls are incredibly dangerous during the winter, so never attempt to climb them, or climb out onto the rocks above them. Areas all around waterfalls and water in the winter are slick, significantly increasing your chances of slipping and falling. Always stay on the trail and on observations decks. Photo by local Maggie Valley Photographer: Luke Sutton Photo. Follow him on Instagram! Did you know that Maggie Valley has one of the premier ski resorts in the Blue Ridge Mountains? Cataloochee Ski Area is generally open from Mid-November to late March and offers 18 ski slopes and trails. Slopes are available for beginners, intermediate skiers, and experts as well. They even have a slope specifically for snowboarders that provides rails, boxes, jibs, and jumps. The resort also provides three chairlifts and two conveyor lifts to the top of the slopes. The Sport Shop, located in Maggie Valley provides lift tickets, gear rentals, and gear for sale as well. Up at the slopes, you’ll find a restaurant, bar, gear shop, and gift shop in the main Lodge. Here is their full brochure for more information. Another exciting winter attraction by Cataloochee Ski Area is Tube World, located in Maggie Valley across from Ghost Town. Tube World offers tubing for everyone, from mid-December to March, depending on weather conditions. The cost for tubing is $25 per person, per session. Sessions are one hour and 45 minutes long and run every two hours. There is a 42″ minimum height requirement. Reservations are required. For children that don’t meet the height requirement for tubing, Tube World offers the Wee Bowl Snowplay Area. Wee Bowl is open on a limited basis as weather and snowmaking allows. Cost for Wee Bowl is $5. 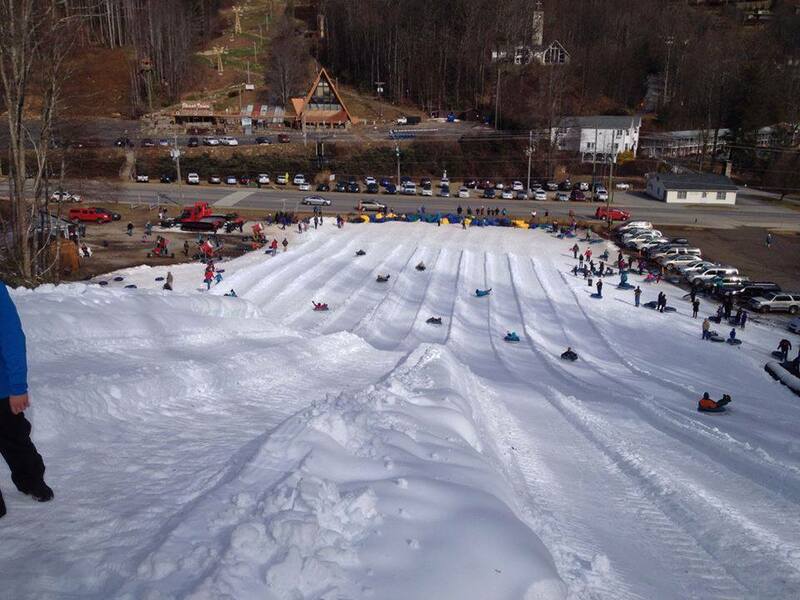 More information on Tube World is available on the Cataloochee Ski Area website. Any time of the year is a wonderful time to watch a sunset or sunrise, but winter seems to offer some of the most beautiful. The lack of foliage provides better views, and the crisp clear winter skies provide exceptional beautiful color. But even from in the Valley itself, you can see the beautiful sunrises and sunsets. If you’re lucky, your rental cabin or hotel/motel will provide a lovely view. There is always great food to eat in Maggie Valley and nearby Waynesville NC. While some restaurants close for the off-season, many Maggie Valley restaurants remain open. See our full listing of local restaurants – but you’ll want to call ahead to confirm if they are open and to get their winter hours. Maggie is well known for its specialty shops, including souvenir stores, boutiques, wood carvings, sweets, antiques and much more. While some stores close for the winter, many remain open. Check out our complete list of Maggie Valley Shops and Stores for more information. Maggie Mountaineer Crafts is our personal favorite! Elevated Mountain Distilling Company is a craft distiller of small batch, top-shelf whiskeys, and spirits and is based in Maggie Valley, NC. Elevated Mountain Distilling Company operates in an 11,000 sq. ft. facility that encompasses the distillery, barrel storage, bottling area, product development/quality control lab, and gift shop. They are “extremely proud of the facility layout and process design enhancing wastewater management, ventilation management, and other features that set us apart in the craft distilling industry”. Interested in being a Master Distiller for a day? Visit their website to book a tour and taste samples. You can also purchase merchandise, including limited quantities of their distilled products at their gift shop. Maggie Valley Puzzle Rooms provides themed rooms that are physical adventure games in which you search for clues and solve puzzles. Sixty minutes in a room sounds like a long time until the pressure starts building to solve all of the clues. You have two goals in the rooms–solve the mystery and get the exit pass to leave the room before one hour is up! Puzzle rooms work best for teenagers and adults, but they also have special puzzle rooms for younger children as well. Visit their website for more information, and to book your reservations! Can you solve the puzzle? The largest privately owned home in America, Biltmore Estate is located less than hour’s drive from Maggie Valley. The estate not only houses the famous home, the gardens, a shopping center, two hotels, restaurants, horse riding stables, and more. Many don’t realize that the estate is full of really nice hiking trails as well, that will take you through the remote backwoods, and by many of the water lagoons, ponds, and creeks on the property. During November through January, you can see Biltmore house decorated for Christmas, which is absolutely beautiful. They even have reservation only candlelight tours in the evenings. If you plan to visit more than once, consider getting a season’s pass. By purchasing your tickets in advance and online, you’ll get a discount. Any time of the year is always a great time to drive The Blue Ridge Parkway. Winter has its benefits due to far less traffic, and better views due to the foliage being gone. Due to the high elevations of the Parkway, you’ll want to check their road closures page to learn about possible closures due to snow, ice, and other weather conditions. Additionally, ALL Parkway facilities are closed during the winter, meaning visitors centers, bathroom facilities, and park offices are closed. We love driving the parkway in the winter, you’re sure to see sights you don’t normally see when driving during other times of the year!